Sustainability is in Schneider Electric’s DNA. It is rooted in everything we do. Our mission is to help our customers meet their sustainability goals while continuing to grow their business. But we must start with ourselves. We know that sustainable businesses are more innovative, efficient and having more engaged employees. Businesses really can reduce their resource consumption while thriving in today’s economy. The following are key learnings from our sustainability program. The first step towards achieving long-term sustainability is knowing where you stand at all times. There is real power in seeing data in order to act on it. Specifically, Schneider Electric has developed a scorecard called the Planet & Society barometer. Since 2005, we have relied on this sustainable development measurement tool to highlight each round of three-year commitments to specific objectives that advance three pillars: planet, profit, and people. The barometer’s 16 indicators show how we’re doing towards meeting sustainability megatrends head on: climate, circular economy, development, ethics, and health and equity. It is one way we drive our commitments to the United Nations Sustainable Development Goals (SDGs), a universal call to action to end poverty, protect the planet, and ensure that all people enjoy peace and prosperity by 2030. For example, we measure and report our CO2 footprint. From transportation alone, we have achieved 11.2% CO2 savings since January 2015, already exceeding our three-year goal of 10%. And 82.3% of our recommended suppliers embrace ISO 26000 guidelines (sustainable development criteria). In terms of our commitment to people, as of December 2016, 75% of our employees work in countries with a Schneider Electric gender equity pay plan (with a goal of 85% by the end of 2016). Our attitude, approach, and achievements have not gone unnoticed. We ranked 3rd on this year’s Corporate Knights Carbon Clean200™ List. Additional rankings affirm our efforts are far-reaching and, more important, they motivate us to maintain — and even exceed — the high standards we have outlined for ourselves. A sustainable company is also a responsible one. Ethics are ingrained in our company policies and culture, and more and more customers are looking for fundamentally ethics-driven companies. We nurture responsible employees who, in turn, place ethics at the center of interactions with customers, suppliers, and partners. I am pleased that Ethisphere® has named us one of the world’s most ethical companies for the seventh consecutive year. And 93.4% of our entities have passed our internal Ethics & Responsibility assessment (as of December 2016). Beyond our company and customers, this spirit influences how we engage with society in general. We are never shy about our mantra that energy is a basic human right. At present, 1.2 billion people worldwide do not have basic access to electricity. Another billion don’t have access to reliable electricity. It is our mission to reduce this inequality. Approximately 4.2 million households at the base of the energy pyramid now have access to energy thanks to Schneider’s low-carbon energy solutions and Access to Energy programs. We continue to grow this figure. Training is a pillar of our efforts. We want to make sure that wealth is being created locally and sustainably as access to energy closes the energy gap, community by community. This year, we integrated entrepreneurship in our electricity training programs. For example, see how women in Brazil are launching energy-related entrepreneurial programs. We know that this energy gap affects developed economies, too. Fuel poverty exists when people cannot heat their homes comfortably or affordably, whatever the cause (low income and/or high rent and energy bills). 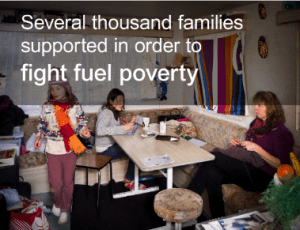 We support many of these families in partnership with the non-profit organization Ashoka by funding social innovation projects to tackle fuel poverty. This year Ashoka is focusing on projects in Portugal, Spain, Italy, Greece, and Germany. Sustainability is a core value to our company, but we also know the difference we can make in the world by helping our customers become more sustainable while driving growth. We enable customers to see and control their energy consumption and CO2 footprint with our IoT-enabled EcoStruxure™ architecture . Our services help customers build sustainability strategies, comply with regulations and increase their use of renewable energy. We work with companies around the world to build a more sustainable future for all of us. The endgame of any company in any industry has to be sustainability. It’s a strong value to us, our employees, our shareholders, our customers, and our planet. We help customers make their data centers buildings, homes, manufacturing processes, and the grid more efficient over time. You can see how we’re doing in latest Strategy & Sustainability Highlights report.